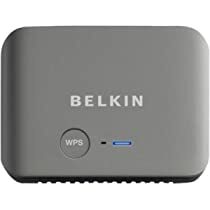 The Belkin Wireless Dual-Band Travel Router gives you a high speed WiFi connection that is perfect for hotel rooms and airports. So you don't have to rely on wired Ethernet connections or slow bandwidth. Get multiple mobile devices online simultaneously. Dual Band speed for video on the go. Advanced Dual-band performance is perfect for watching movies, TV shows and surfing the Web. The Travel Router's small size makes it easy to pack, and it comes with a handy, handsome travel case that neatly holds its Ethernet cable and power supply. The standard transmission rates 150Mbps (for 2.4GHz and 5GHz), 54Mbps, and 11Mbps are the physical data rates. Actual data throughput will be lower and may depend on the mix of wireless products used.